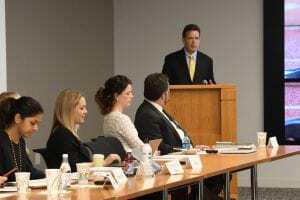 USCIB teamed up with the Institute for Human Rights and Business on April 9 to organize a full-day workshop to highlight the recently launched Center for Human Rights and Sport. 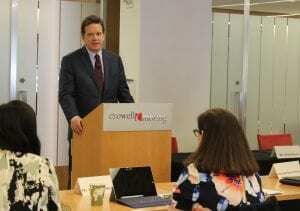 The event raised awareness to U.S. companies of the role of the new center, the connection between sports and human rights, and ways companies can engage. Over fifty participants contributed to the dialogue over the course of the day, as well as representatives from the U.S. Department of State, former Olympic athletes, and other stakeholders. USCIB members from Nike, Hilton and Bechtel served as panelists during sector-specific sessions on leveraging relationships and partnerships across supply chains to ensure accountability and compliance with human rights and labor standards. In addition to partnerships, Bechtel’s Global Head of Sustainability and Vice Chair of USCIB’s Corporate Responsibility and Labor Affairs Committee Tam Nguyen noted the benefits of using data analytics, Artificial Intelligence and machine learning to create predictions about forced labor and human rights violations and provided an example of an application of these new technologies in the construction sector. The Center’s first CEO Mary Harvey outlined main takeaways in her wrap-up remarks, which included the challenge in re-examining what leverage means for companies, the power and potential of accountability and collective action, and appropriate and effective mechanisms for grievance and remedy in sport. USCIB will continue to follow this topic closely. At the next USCIB-IOE-Coca-Cola Conference scheduled for September 12-13 in Atlanta, there will be a panel dedicated to this crucial topic. At the end of the year, USCIB will participate in the ILO’s Global Dialogue Forum on Sports and Decent Work. Based in Geneva, Switzerland, the Center for Sport and Human Rights brings together a diverse set of stakeholders to work towards a world of sport that fully respects human rights by sharing knowledge, building capacity, and strengthening the accountability of all actors through collective action and promotion of the Sporting Chance Principles. In fulfilling this mandate, the Center is committed to being independent, principles-based, inclusive, diverse, collaborative, accessible and trusted. 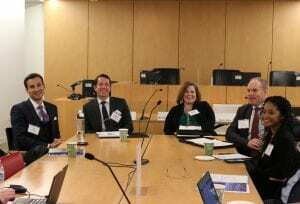 USCIB held a special briefing on April 8 in Washington, DC with leading members, USCIB staff and the U.S. Department of State focusing on how USCIB is responding to challenges in the multilateral system around business and society. Over thirty participants attended the briefing, hosted by USCIB member Beveridge and Diamond, including Director of the Office of Economic and Development Affairs from the U.S. Department of State Margy Bond, President of Woods International and Chairman of the Wilton Park USA Foundation Tom Woods and USCIB President and CEO Peter Robinson. USCIB members in attendance included representatives from AT&T, Bayer, Cargill, Chevron, DHL Express, KPMG, McDonald’s and PepsiCo, among others. 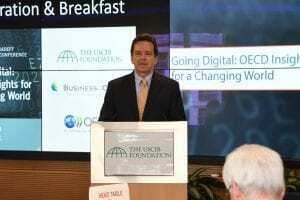 Bond, who gave a keynote address, noted that USCIB members have been a driving force for constructive business engagement at the United Nations and emphasized that the U.S. government is focused on enhancing private sector involvement at and partnerships with the UN, which will not only help achieve global goals but also help promote growth and create jobs in the United States. However, as business is expected to step up and provide the investment, innovation and capacity to scale solutions that can solve the world’s largest problems, USCIB members find themselves increasingly in the cross-hairs as anti-business sentiment continues to find traction among policymakers, NGOs and UN entities around the world. With regards to trust, another value add to this meeting was an overview of the 2019 Edelman Trust Barometer by Edelman Intelligence Managing Director Kari Butcher. Butcher gave insight into the findings of this year’s report and how business can use the data in the report to move forward on solving today’s societal challenges. Participants had the opportunity to discuss and learn about three new initiatives launched by the USCIB Foundation to respond to these challenges, as well as opportunities for greater engagement through USCIB. These new initiatives are designed to strengthen the pivotal role business plays in furtherance of the 2030 Agenda with regards to nutrition-related SDGs, inclusive engagement of business in key UN forums, and the private sector’s role as a trusted partner in meeting the challenges facing society. Together for Nutrition Principles– a joint project between The USCIB Foundation, the Global Alliance for Improved Nutrition (GAIN), and the Wilton Park Foundation defining a set of principles for public-private sector engagement to advance the nutrition-related SDGs. All In Campaign– an initiative bringing policymakers and global businesses together in key UN cities to begin a global conversation on opportunities for inclusive engagement with businesses from all industry sectors as essential to meeting the SDG goals and other 2015 outcomes. Business in Society: A Crisis of Trust – a USCIB Foundation project that aims to better understand and influence attitudes and behaviors among policymakers through data, analysis and education to demonstrate that business can be profitable and still be trusted partners in meeting societal challenges. Moving forward, all of the above will be highlighted in USCIB’s 2nd Annual Geneva Week May 6-10, the first All In Campaign Roundtable scheduled to take place in Geneva during Geneva Week, a planned event on the impact of business SDG partnerships on the margins of the High Level Political Forum in July in New York, as well as additional planned All In Campaign roundtables in cities around the world. USCIB encourages members to participate and welcomes feedback. The Third Meeting of the Open-ended Working Group (OEWG3) of the International Conference on Chemicals Management (ICCM) convened in Montevideo, Uruguay, April 2-4. Approximately 350 representatives of governments, industry, non-governmental organizations and intergovernmental organizations attended the proceedings. USCIB was a member of the private sector delegation representing the views of downstream users of chemicals, and included Sophia Danenberg of Boeing, who also serves as chair of USCIB’s International Product Policy Working Group, and Mike Michener, USCIB vice president for product policy and innovation. During the meeting, participants assessed progress by the Strategic Approach to International Chemicals Management (SAICM) toward the global goal of achieving by 2020 the use and production of chemicals in ways that lead to the minimization of significant adverse effects on human health and the environment. 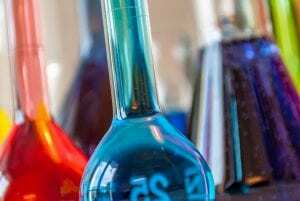 Delegates discussed the sound management of chemicals and waste beyond 2020, when the current mandate of the Strategic Approach is due to expire, and prepared for ICCM5, scheduled for October 5-9, 2020 in Bonn, Germany. The OEWG also considered the planned activities and draft budget of the SAICM Secretariat for the period 2019-2020. The assessment of progress included updates on activities regarding “emerging policy issues” and other issues of concern, including chemicals in products, lead in paint, nanotechnology and manufactured nanomaterials, hazardous substances within the lifecycle of electrical and electronic products, endocrine-disrupting chemicals, environmentally persistent pharmaceutical pollutants, highly hazardous pesticides, and perfluorinated chemicals. The progress assessment also looked at the implementation of the SAICM health sector strategy. The OEWG3 discussions of a possible post-2020 framework was based on a discussion paper produced by the Co-Chairs of the intersessional process since ICCM4, in addition to discussion papers submitted during the session, one by the European Union and the other by the Latin American and Caribbean Group, African Group and several individual Asia-Pacific countries, regarding financial considerations in a post-2020 framework. 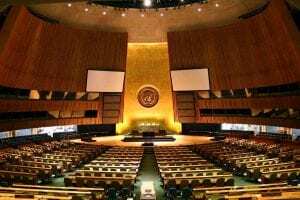 OEWG3 produced a composite text that will be the subject of negotiations at the third meeting of the intersessional process, slated for September 30-October 3 in Bangkok, Thailand. The UK also announced that it will host an expert meeting in August or September 2019 to prepare indicators on the sound management of chemicals and waste for consideration at ICCM5. USCIB partnered with the National Center for APEC (NCAPEC) and C&M International to host an APEC Essentials workshop on March 27 to help participants understand the fundamentals of APEC including its history, objectives and opportunities. The event, which attracted approximately 80 attendees, featured practical case studies led by industry discussants on how several sectors approach priority issues and leverage the APEC platform. Private sector participation in APEC is organized under the leadership of the NCAPEC, which serves as the designated 2019 U.S. Strategic Partner for the CEO Summit, Secretariat to the U.S. members of the APEC Business Advisory Council (ABAC) and as Chair and Secretariat of the U.S. APEC Business Coalition. USCIB addressed a number of issues through APEC to advance discussions across a range of issues including chemicals regulation, advertising self-regulation, data privacy, customs and digital trade. USCIB members and staff have engaged in several APEC working groups, including the Chemical Dialogue, APEC Business-Customs Dialogue, Customs Procedures Virtual Working Group, Alliance for Supply Chain Connectivity, the Electronic Commerce Steering Group and Data Privacy Subgroup. The program featured Matías Pinto Pimente, head of the economic department and trade commissioner at the Embassy of Chile in Washington DC; Emily Fischer, principal APEC coordinator, economic policy advisor, U.S. Department of State; Jillian DeLuna, director for APEC affairs, Office of the U.S. Trade Representative; Monica Hardy Whaley, president, National Center for APEC; and Ambassador Robert Holleyman, president and chief executive, Crowell & Moring International; Partner, Crowell & Moring; former Deputy U.S. Trade Representative. Chile will host this year’s APEC meetings. During the months of December, January, and February 2018-2019, USCIB Staff submitted comments on potential trade agreements with Japan, the EU, and the UK, testified on a potential trade agreement with the UK, issued recommendations in on how business can support WTO reform, met with Nan Fife at the State Department on OECD issues, provided two sets of comments on drafts of the B20 Tokyo Summit Joint Recommendations, met with State department officials following the ITU Plenipotentiary Meeting and IGF, provided input on the development of a 21st Century Customs Framework, commented on proposals concerning determining the foreign tax credit and the Base Erosion Anti-abuse Tax, and much more. Below are summaries of these and other highlights from the activities of USCIB in Washington, D.C. over the last three months. If you have any questions or comments, or want more information on a specific topic, please contact any of the staff members listed at the end of this brief. Business Pushes for Comprehensive Trade Deal with Japan: USCIB submitted comments in late 2018 to the United States Trade Representative (USTR) outlining negotiating objectives for a U.S.-Japan Trade Agreement. USCIB supports negotiation of a comprehensive trade agreement with Japan as part of a broader strategy to open international markets for U.S. companies and remove barriers and unfair trade practices in support of U.S. jobs. USCIB outlined its priority issues, which include digital trade, intellectual property, media and entertainment services, investment, customs and trade facilitation, express delivery services, electronic payment services, regulatory coherence, government procurement and financial services. The Administration has released negotiating objectives for a U.S.-Japan FTA, negotiations for which are due to begin soon. USCIB Submits Negotiation Objectives for U.S.-EU Trade Deal: USCIB submitted negotiation objectives for a U.S.-EU Trade Agreement to the United States Trade Representative (USTR) on December 11, 2018. The submission was filed in response to USTR’s request for comments and emphasized the importance of a comprehensive negotiation, covering not only market access for goods, but also critical services issues. The USTR request for comments follows the administration’s announcement to Congress on October 16, 2018 of its intention to initiate negotiations on a U.S.-EU Trade Agreement. USCIB supports negotiation of a comprehensive trade agreement with the EU as part of a broader strategy to open international markets for U.S. companies and remove barriers and unfair trade practices in support of U.S. jobs. USCIB priority issues for negotiation of a U.S.-EU agreement include investment, customs and trade facilitation, express delivery services, improved regulatory cohesion, digital trade, intellectual property, government procurement and SOEs, and financial services. U.S.-UK Trade Agreement: USCIB Submits Negotiating Objectives and Hampl Testifies: USCIB submitted negotiating objectives for a high standard and comprehensive U.S.-UK Trade Agreement on January 16, 2019. USCIB’s submission was based on the assumption that the UK will be successful in exiting the EU, allowing for the ability to negotiate trade agreements with trade partners outside of the EU. Priority issues for negotiations of a U.S-UK Trade Agreement include digital trade (including cross border data flows, forced localization, cybersecurity and digital taxation), intellectual property, media and entertainment services, financial services, electronic payment services, customs and trade facilitation, express delivery services, regulatory cohesion, investment, government procurement, and chemicals. Eva Hampl, Senior Director, Investment Trade and Financial Services, provided testimony before the Trade Policy Staff Committee (TPSC) at the public hearing on January 29, 2019. USCIB Urges Removal of Steel and Aluminum Tariffs in USMCA: USCIB joined a coalition of other trade and industry organizations to send a letter to Secretary Wilbur Ross and Ambassador Robert Lighthizer on January 23, 2019, regarding the 232 tariffs on steel and aluminum. The coalition, recognizing the importance of the new U.S.-Mexico-Canada Agreement ratification to the economic interests of all three countries, underscored the importance of lifting these tariffs, as well as the removal of all retaliatory tariffs on trade among the three countries. WTO Modernization: USCIB Recommendations and Robinson Op-Ed: As World Trade Organization (WTO) member governments move forward this year with efforts to reform the WTO, USCIB issued recommendations in January 2019 on how business can support the WTO and its efforts to improve the organization. USCIB’s recommendations also noted the importance of the WTO as a cornerstone of the global rules-based trading system that has helped spread growth and development for decades. They focused on addressing subsidies and other market-distorting support provided to state-owned enterprises (SOEs), the establishment of new rules for current issues such as digital trade and customs processes on electronic transmissions, and ensuring a properly functioning appellate body, among others. USCIB President and CEO Peter Robinson appealed for a strong business role in efforts to modernize the global trade body in an Op-Ed published in The Hill. Robinson wrote that he views of the private sector, which has a direct stake in the rules that result from such government-to-government discussions, should be actively solicited and given careful consideration by WTO member states. Broad-Based Business Coalition to Press for USMCA Adoption: The United States Council for International Business (USCIB), which represents America’s most successful global companies, has joined with an array of U.S. companies and industry associations to urge swift approval by Congress of the United States-Mexico-Canada Agreement (USMCA), an updated and modernized framework for expanded trade, investment and market integration in North America. The USMCA Coalition, encompassing more than 200 leading companies and major associations representing farmers and ranchers, manufacturers, service providers and technology companies, was formally launched on February 26, 2019. BIAC Chair O’Reilly Talks/Listens to USCIB: The Chair of “Business at OECD” or Business and Industry Advisory Committee (BIAC), Phil O’Reilly met in person in New York, and by video link to Washington, on January 11, 2019, with USCIB Board members, committee chairs and staff. 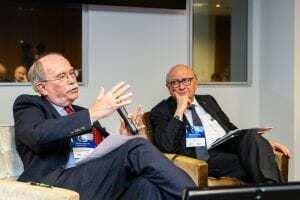 Phil reported on BIAC’s annual meeting with the OECD senior leadership (Secretary General Gurria, Deputy Sec Gens, and key ambassadors) and laid out BIAC’s agenda and priorities for 2019. Rick Johnston of Citi and a Vice-Chair of the BIAC Board, also offered his perspectives on BIAC priorities and challenges and on where the OECD is heading. Russel Mills, the new BIAC Secretary General, also called in for the session. Russel has long experience in the U.S. chemical industry (Dow and Dupont) and was long-time Chair of BIAC’s Environment committee. We had an excellent, candid discussion with Phil O’Reilly. BIAC is in good hands. USCIB Team and Members Discuss with Senior State Department Leaders Business Access/Treatment at UN Agencies: USCIB and some key member companies have become increasingly worried about discrimination against business in several U.N agencies, including but not limited to the World Health Organization. We have been active in raising these concerns with the U.S. Missions to the UN in New York City, Geneva, and Rome as well as to the International Organizations (“IO”) Bureau at the Department of State. On January 24, 2019, despite the challenges of the government shutdown, key leaders from the IO Bureau came to USCIB’s Washington office e for a very candid discussion with key member companies and staff about business treatment access in the parts of the UN system. We followed that up with a more detailed meeting with State IO experts at the Department on February 15. USCIB VPs Norine Kennedy, Mike Michener and Shaun Donnelly are taking the lead on this important work. The State Department and our U.S. Mission have been great partners, as have some international counterparts in our global network, but this will be a long-term issue with parts of the UN system and a top priority for USCIB. USCIB Talks OECD with State Department: On February 12, 2019, USCIB Senior Vice President for Policy and Government Affairs, Rob Mulligan, led a USCIB staff team in a detailed meeting with the OECD “desk” team at the Department of State which coordinates overall U.S. dealings with the OECD and backstops the U.S. Mission to the OECD in Paris. Nan Fife, Director of the Economic Policy and Public Diplomacy office in state’s Economic and Business (“EB”) Bureau led the State team. We had an excellent, frank exchange on a range of issues related to the OECD and ended up in agreement on assessments and priorities, and concerns. One important development we will be actively monitoring is progress in getting a new U.S. Ambassador confirmed and out to Paris on the ground. Pamela Bates, an experienced former State Department economist, has been quickly renominated after her earlier nomination (and many others) expired at the of the previous Congressional session. Getting Ms. Bates confirmed and on-the-job in advance of the OECD’s annual May Ministerial is an important priority for USCIB and for State. Donnelly Talks Business and BIAC Issues at Training Session for USG Delegates to OECD: USCIB Vice President Shaun Donnelly was a panelist again this year at the third annual “Delegates Training Session” organized and hosted by our State Department partners who coordinate all OECD work. State annually invites all U.S. Government employees (senior or junior) from all USG agencies who represent the USG at any OECD Committee, Working Group, or other meeting to this all-day training session on “how to be an effective delegate/advocate” and broad USG policies and priorities regarding the OECD. Again this year, our State colleagues devoted a lengthy session to the importance of coordinating with the U.S. private sector, featuring the USCIB and BIAC network. Shaun, the only business panelist, explained BIAC and USCIB, our unique roles, and how we operate. 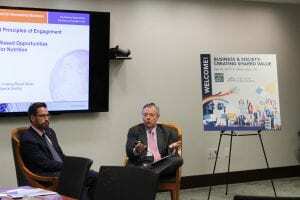 He was joined on the panel by three USG experts active in their respective OECD committees and with USCIB. We appreciate State organizing the session, for the focus on working with the private sector, and especially for including USCIB. USCIB Discusses Digital Trade with Nick Ashton-Hart: On January 16, 2019, USCIB staff met with Nick Ashton-Hart, the Geneva Representative of the Digital Trade Network (DTN), as well as representative of ICC United Kingdom on the UK delegation to the meetings of the International Telecommunications Union. USCIB is part of the DTN along with a few other ICC national committees and several companies. The DTN is focused on supporting the effort in the WTO to move forward on the E-Commerce initiative, which is a priority issue for USCIB. 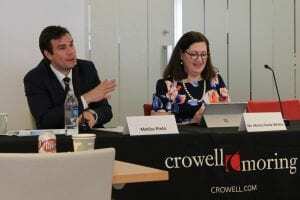 State Department Officials Explore Challenges in Internet Governance with USCIB Members Following 2018 ITU Plenipotentiary Meeting and 2018 Internet Governance Forum: The ICT Policy Committee Meeting on December 13, 2018, featured discussions with State Department officials about the implications of year-end initiatives that potentially could affect governance of the Internet stemming from the International Telecommunication Union (ITU) Plenipotentiary, October 29-November 16, 2018 in Dubai, UAE, the 2018 Internet Governance Forum (IGF), November 12-14, 2018, in Paris, France, and French President Emmanuel Macron’s Paris Call for Trust and Security in Cyberspace. 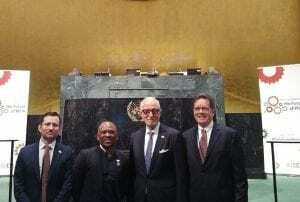 The ITU Plenipotentiary meeting included positive, precedent-setting developments – namely, the election of U.S. candidate Doreen Bogdan-Martin to Director of the ITU Telecommunication Development Bureau. In addition, through thoughtful pre-meeting diplomacy, the U.S. Government was able to derail problematic resolutions that would have brought Artificial Intelligence (AI) and cybersecurity under the ITU’s purview. Nevertheless, State Department officials urged USCIB members remain vigilant in 2019 to prevent ITU “mission creep.” Concerning the 2019 IGF, State Department officials and USCIB members both concurred that President Macron’s opening speech – in which he called for greater regulation of the Internet, among other issues – was concerning and raises questions about whether the IGF will remain a forum for discussion or face growing pressure to produce policy outputs. Similarly, the group agreed that if President Macron’s “Paris Call,” which was a non-binding statement of support for cybersecurity principles, was brought into the UN process, the transition from a single-nation to a multilateral initiative could pose problems for the United States and U.S. business. USCIB Members Provide Inputs Aimed at Shaping Japan’s B20 Report: Working under exceedingly tight deadlines, USCIB members from the ICT Policy Committee, the Trade and Investment Committee, the Customs and Trade Facilitation Committee, and the Tax Committee provided two sets of comments during the month of January 2019 concerning the first and second drafts of the B20 Tokyo Summit Joint Recommendations. Under the theme, “Society 5.0 for SDGs,” USCIB members emphasized the following: (1) promote interoperability of risk-based security and privacy protection standards across jurisdictions so as to ensure free flow of data, information, ideas and knowledge across borders; (2) foster e-commerce by ensuring free business decision regarding the location of computing facilitates and confidentiality of corporate information; (3) firmly commit to not imposing customs duties and processes on electronic transmissions, permanently; (4) prevent the weakening of intellectual property protections and enforcement mechanisms that underpin trade in digital content and products; and (5) support the OECD Inclusive Framework process to develop a consensus, income-tax based solution that can be applied to the broader digitalized economy. USCIB members further urged G20 governments to resist the temptation to regulate emerging technologies such as Artificial Intelligence, recognizing that such efforts cannot keep pace with rapid technological innovation. USCIB Members Follow Up Comments to UN High Level Panel on Digital Cooperation by Urging a Holistic Approach to Digital Policy-Making: On January 17, the ICT Policy Committee followed up its November 30, 2018 submission to the U.N. High-Level Panel on Digital Cooperation (HLPDC) by addressing specific questions posed by the panel secretariat. By urging a “holistic approach” to digital policy, USCIB clarified that the approach envisioned would go beyond use of digital technologies by the information, communications, and technology (ICT) sector, and consider how ICTs can serve as enablers for innovations across all sectors, such as in healthcare, education, finance, and energy, to name a few. “This requires cutting across policy silos and different departments and agencies within governments and intergovernmental bodies, which we refer to as “whole-of-government,” USCIB stated. Members further urged that governments should strengthen their collaboration with internal and external stakeholders to create flexible, forward-looking and integrated policy frameworks. The HLPDC was established by the UN Secretary-General in July 2018 to advance proposals to strengthen cooperation in the digital realm and contribute to the broader global dialogue on how interdisciplinary and cooperative approaches can help ensure a safe and inclusive digital future. OECD Kicks Off Review of 2013 Privacy Framework with Advice and Inputs from USCIB Members: On February 4, 2019, the OECD Working Party on Security and Privacy in the Digital Economy (SPDE) began a review of the 2013 Recommendation of the Council concerning Guidelines Governing the Protection of Privacy and Transborder Flows of Personal Data (i.e., “Privacy Guidelines”). The review will be undertaken by a special group of 40 privacy experts, which includes Barbara Wanner, USCIB Vice President for ICT Policy, and representatives from AT&T, Google, Oracle, Mastercard, and The Walt Disney Company. The group will consider how technological progress, changes in data-sharing practices by organizations and individuals, and the increasingly patchwork nature of global privacy frameworks may be addressed by revising and updating the OECD’s six-year-old Privacy Guidelines. USCIB Submits Comment Letters to Regulators: The Tax Committee dedicated significant resources to providing comments on a variety of topics over the months of December, January, and February. These comments can be found on the recent accomplishments section of the USCIB Tax Committee page. Comments included letters on: proposals concerning: determining the foreign tax credit; the Base Erosion Anti-abuse Tax; interest allocation under 163(j); the taxation of hybrid entities and transactions; and the UK digital services tax. Customs and Trade Facilitation Committee Responds to 21st Century Customs Framework: On February 4, 2019, the USCIB Customs and Trade Facilitation Committee submitted comments in response to a U.S. Customs and Border Protection (CBP) Federal Register Notice request for public comments on the “21st Century Customs Framework”, a CBP initiative to better position CBP to operate in the 21st century trade environment. USCIB Comments included Recommendations, Concerns, Points for Consideration, Responses to specific CBP requests for comment on the topics of Emerging Roles in the Global Supply Chain; Intelligent Enforcement; Cutting-Edge Technology; Data Access and Sharing; 21st Century Customs Procedures; and Infrastructure. USCIB Participates in Business Coalition Fly-in on China Tariffs: USCIB Senior Director, Investment, Trade and Financial Services, Eva Hampl participated in the Fly-In organized by Tariffs Hurt the Heartland the nationwide campaign against tariffs, combining the efforts of Farmers for Free Trade and Americans for Free Trade, of which USCIB is a member. 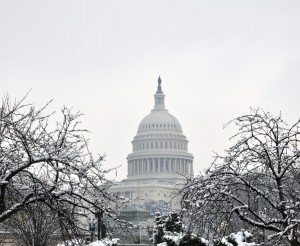 Groups of representatives from associations and companies covered over 150 meetings with Senate and House offices from both sides of the aisle over February 6-7, 2019, in anticipation of an increase of tariffs on the $200 billion worth of Chinese imports from 10% to 25%. The group emphasized the concern about the tariff actions, noting that the various tariffs currently in place are causing significant damage to U.S. companies and jobs, with prospects even more dire were thee tariffs to continue or increase in the future. At this time, the intended increase has been formally delayed until further notice. Membership Meetings The USCIB membership department and policy staff met with representatives from member companies Qualcomm, Ferrero and Cargill to develop our understanding of their policy priorities for the next year and beyond, and to see how USCIB can better serve their policy needs. New Members: USCIB has recently welcomed Business Software Alliance, DLA Piper, Netflix, R.J. Reynolds, The Tax Foundation, and Westinghouse Electric Company as new members. 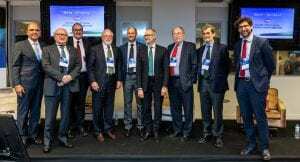 The OECD Summit on Going Digital, held March 11-12 in Paris, presented the main findings and policy messages of the OECD’s two-year Going Digital Project. In light of this milestone, USCIB teamed up with the OECD and Business at OECD to organize an event in Washington DC on March 25 bringing together over fifty representatives from U.S. government, the private sector and press to discuss outcomes and next steps. The March 25 Conference, hosted by the AT&T Forum for Technology, Entertainment and Policy, introduced the Going Digital Toolkit and included in-depth discussions on indicators, experiences and innovative policy practices, particularly as they relate to economic growth and societal well-being, privacy, security against cyber-threats, as well as harnessing the power of Artificial Intelligence (AI) for economic and social prosperity. Common themes that emerged among panelists and participants included emphasis on economies to invest in people through increased access to STEM training, innovative use of apprenticeships and skills-based training and retraining programs to ensure that the work force is adaptable and is prepared for the challenges of the future. There was also consensus on the need to reduce barriers to promote AI innovation and application to realize more of the potential of AI in providing new opportunities and even creating new sectors of industries. At the same time, governments need to establish principles to ensure public trust and confidence in AI technologies. Other speakers at the conference included OECD Director for Science Technology and Innovation Andy Wyckoff, Director for International Communications, Information, and Emerging Technologies from the U.S. Department of State Adam Lusin as well as The White House Assistant Director for Artificial Intelligence, Office of Science and Technology Lynne Parker. 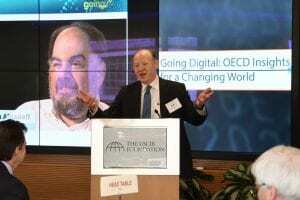 The day-long event titled, Going Digital: OECD Insights for a Changing World, was dedicated to the late Joseph Alhadeff and commemorated his decades-long leadership and contribution to the ICT space both domestically and globally. Alhadeff was a long-time USCIB supporter, colleague and mentor who served on the USCIB Board and was a Vice Chair of the USCIB ICT Policy Committee for over 15 years. The world’s highest-level decision-making body on environmental policy the Fourth Session of the UN Environment Assembly (UNEA) met in Nairobi, Kenya, from March 11 – 15 under the overarching theme “Innovative Solutions for Environmental Challenges and Sustainable Consumption and Production”. A record number of 5,000 delegates from 179 countries, NGOs and business attended. Many stayed on for the 2nd round of deliberations on a proposed UN Global Pact for Environment (GPE) from March 18 -20. USCIB members, including the American Chemistry Council, Croplife, IBM, 3M and Novozymes, and USCIB staff were involved in several events during and alongside the UNEA4 conference and subsequent GPE deliberations. USCIB worked closely with the U.S. government delegation attending the meeting, and held a roundtable for members in Nairobi with Principal Deputy Assistant Secretary of State Marcia Bernicat and other administration officials. Speaking at a high-level dinner for government delegations convened by Global Business Alliance for the Environment (GBA4E), Norine Kennedy, USCIB vice president for environment, energy and strategic international engagement, stated that U.S. business regards the 17 SDGs as the blueprint of integrated objectives for environment, social, development, and economic policy and actions. “It will take ‘out of box’ thinking by governments and business to implement systems-thinking and systems-doing approaches on environmental protection,” said Kennedy. improve coordination across existing multilateral agreements and environment related instruments. Although UNEA4 reviewed options for policy cooperation and action on a wide range of environmental matters, the main political momentum focussed solidly on addressing plastic waste, especially in the form of marine debris and/or single-use plastics. Governments proposed three separate resolutions on marine debris, and India added a fourth resolution on single-use plastics. Numerous NGOs on hand also targeted plastic waste and called for a treaty and ban on plastics, citing environmental impact and its indirect link to climate change through petro-chemicals. 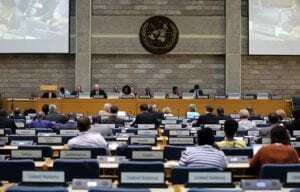 The eventual outcomes of UNEA4 stopped short of launching a legally binding treaty negotiation on these matters, but expectations that political pressure will continue to build behind these challenges remains high. UNEA4 received and reviewed two major international environmental agenda-setting reports: the 6th Global Environmental Outlook (GEO6) and the Report of the International Resources Panel (IRP). These will likely drive international policymakers’ attention, much as the IPCC findings are significant rationale for climate policy. Other science-policy connections discussed at UNEA-4 included attention to big data and geo-observation. The 2 reports present scientific expert analysis relating to resource scarcity and health impacts of environmental degradation, and highlight priorities that will surely be considered in further international policy discussions. The IRP report considers the possibility of Science Based Targets for finite resources, applicable to business. Government deliberations on proposed UN Global Pact for Environment concluded with a wide range of views and little evident consensus, beyond general support for the importance of strengthening implementation of international environmental law. Government delegations continued to discuss different definitions of what constituted “gaps” and “challenges” relating to international environmental law. Delegates considered different forms a Pact might take, including a declaration of the UN General Assembly, or additional mandated activity in UNEnvironment, or a legally binding instrument, or some combination of those and other outcomes. The GPE deliberations resume from May 20 – 22, again in Nairobi. The next UN Environment Assembly (UNEA5) takes place in February 2021.